He’s been talking about it for years and years, but it finally happened. My uncle is retired! My aunt planned, and well schemed, a surprise retirement party. And it went off beautifully. Snowy weather and flight delays added a few wrinkles to the surprise, but otherwise, he was truly surprised! And of course, there was tons of good food! No one slaved for days on the food. Instead, it was catered! Shrimp cocktail. 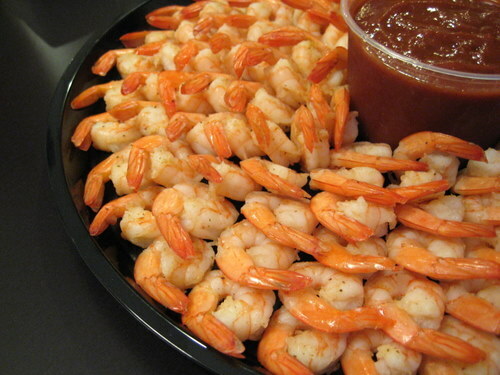 I love any party with shrimp cocktail! 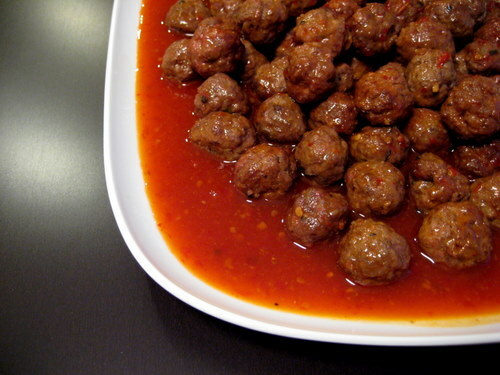 Asian style mini meatballs. What makes the asian? Because they used sweet chili sauce in it. What an easy and brilliant idea. 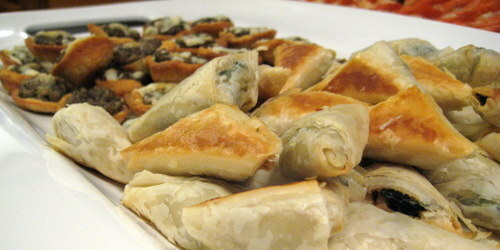 Little mini spanakopita in the front. These weren’t that good. The mushroom cups in the back? Good! Actually, great. And this is coming from a girl who doesn’t really like mushrooms. 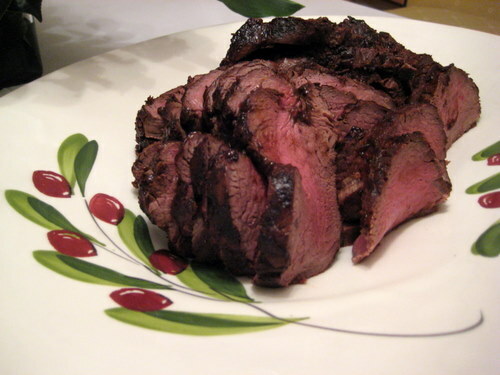 For a main dish, we had beef tenderloin with a mushroom gravy. This was the best entree of the evening. 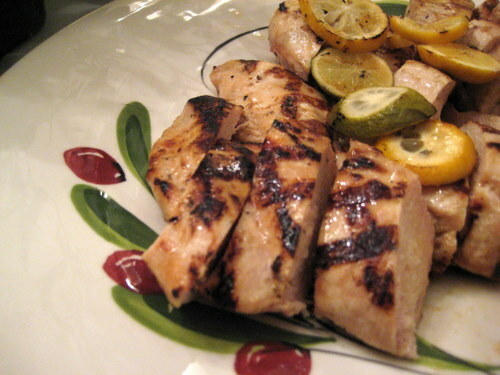 Another entree was lemon chicken. I didn’t try this, but I heard this wasn’t that great. So I’m glad that I skipped it. The other entree was a veggie lasagna. A big vat of lasagna isn’t that photogenic. It was fairly tasty though. I would have preferred that the veggies weren’t so crunchy. 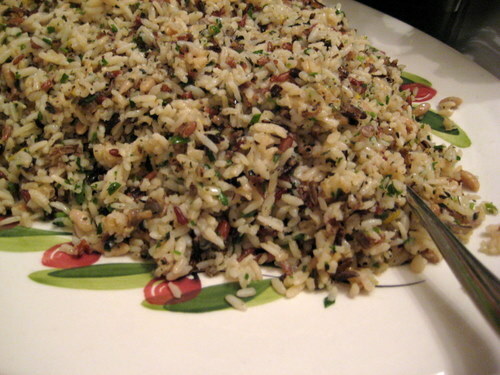 Rice pilaf. Not a favorite. Good, but there were chunks of crunchy bits in here. 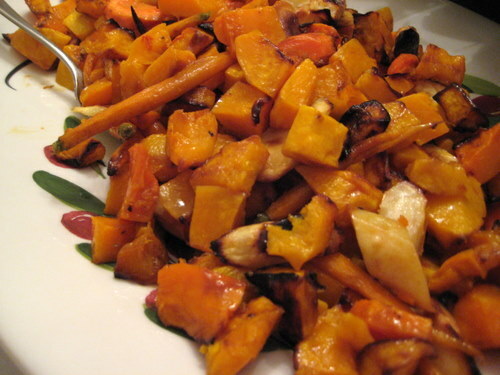 Grilled veggies. I’m not sure what was in here, but there was definitely carrots, carrots, and carrots. There may have been a sweet potato, but I’m not that sure. 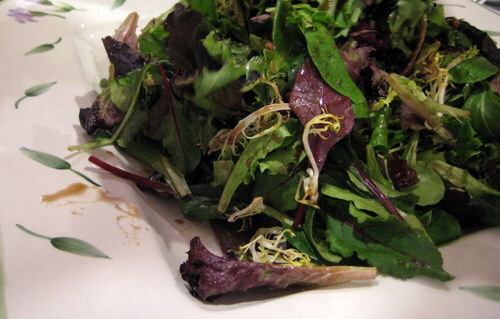 My favorite dish of the entire night was the salad. The mixed greens was nothing special, but it was what what was on top that blew everything out of the water. Candied walnuts, dried cherries, and an amazing balsamic syrup type of dressing. I could have just eaten a giant bowl of this and been stupid happy. This is my dream salad, because it’s like candy! I need to figure out how to make a dressing like that. Because well, I love candy! We also had mocha cake from the korean bakery. And everybody loved it! It was a fabulous party… happy retirement! only when salad tastes like candy! yum!